One of the major computational challenges of the age is the calculation of partial differential equations describing quantum systems and their dynamics. This is both because of their fundamental role in theoretical physics and in physical chemistry and because of the raft of recent important applications, not least to quantum control and the construction of quantum computers and quantum devices. Dispersive equations of quantum mechanics, e.g. Schrödinger, Wigner, Klein–Gordon, Pauli and Dirac equations, possess many structural features that render their computation difficult: their solutions oscillate rapidly, they have important structural invariants (e.g., conservation of energy and of symplectic structure) and often display other features which are exceedingly difficult to model numerically, e.g. integrability, localised solutions, focussing, finite-time singularities... Moreover, often it is of interest to solve the equations in a large number of spatial dimensions. All this means that standard numerical methods are of very limited use. The last two decades have seen substantial revolution in our understanding of this issue, leading to the development of both new important kinds of methods (Hagedorn wavepackets, splitting and composition methods, symplectic methods) and new means of their analysis. The main objective of this event is to follow up on our previous workshop, held in March 2017 at the Institute of Mathematics of Polish Academy of Sciences in Warsaw. We hope to bring together internationally-leading experts quantum computationals, both mathematicians and practitioners, as well as a number of established Polish experts in differential equations and early-career researchers.We expect to offer a number of places to Polish research students who will benefit most from this opportunity. You can download the programme as a PDF. The book of abstracts, also as a PDF. Although we wish to keep the numbers relatively small, we are happy to consider additional participants. 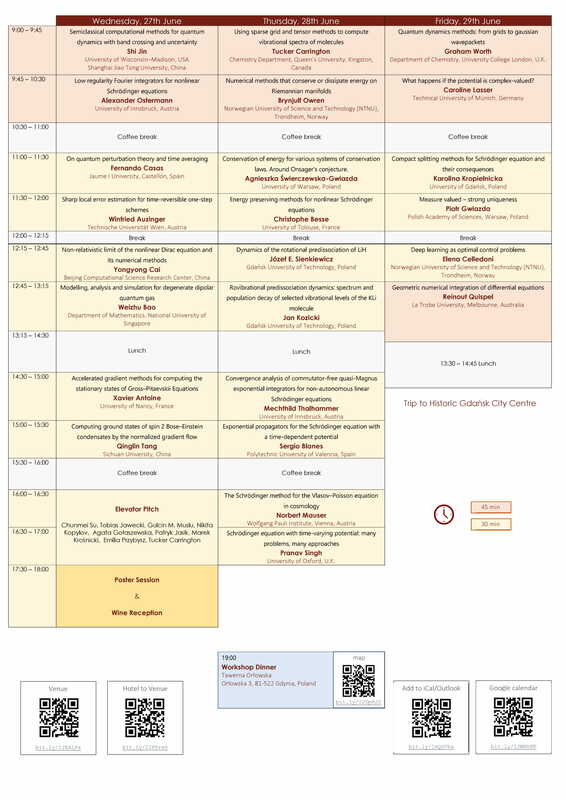 The conference fee of 250 Euros will be expected to cover the cost of accommodation, lunches, conference dinner and coffee breaks. If you are interested in taking part, please contact Karolina Kropielnicka. Please do not forget to fill in the reason for the transfer. Number 'K-525-18' and 'name of the participant' is crucial. DO NOT MAKE ANY PAYMENTS if you do not have the conﬁrmation of participation. 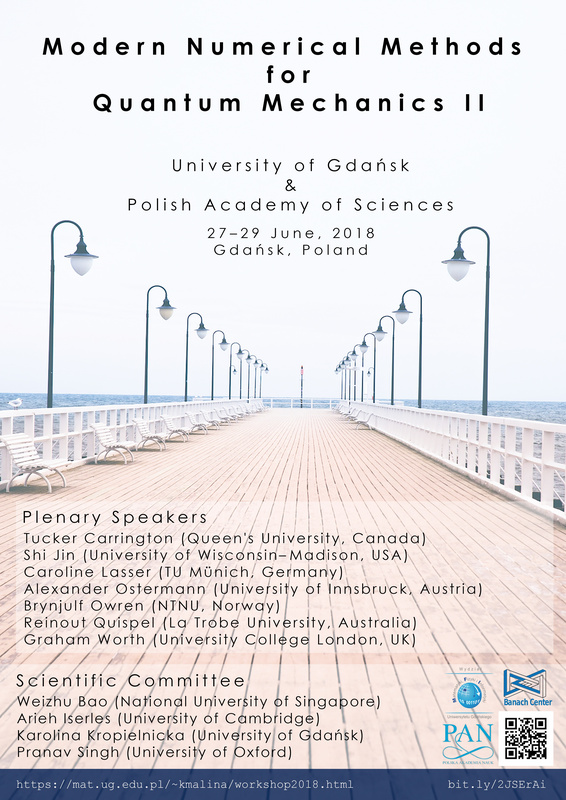 We are keen to encourage a small number of Polish early career researchers (no more than five years after their doctorate) to take part in the workshop. The participation will be free but we expect travel costs to be covered from other sources. If you wish to apply, please email your CV and brief explanation why you expect to benefit from the workshop to Karolina Kropielnicka.